I've seen people talk about putting the HQ dreadnought Bjorn into a drop pod but my drop pod rules don't say they can put a dread in them. Is there a rule I'm missing? Not the happiest thing to bring up in this thread I know, but I am looking to start selling off my 40k collection to free up shelf space and pick up some spare cash. Any recommendations on how and where to best sell them? I was thinking ebay. Also, any recommendations on how to ship them without them becoming damaged or breaking the bank? I have a lot of assembled large models like Imperial Knights or Tervigons. The answer depends on where you are from. You used to be able to put Dreadnoughts in drop pods back in 7th Edition. 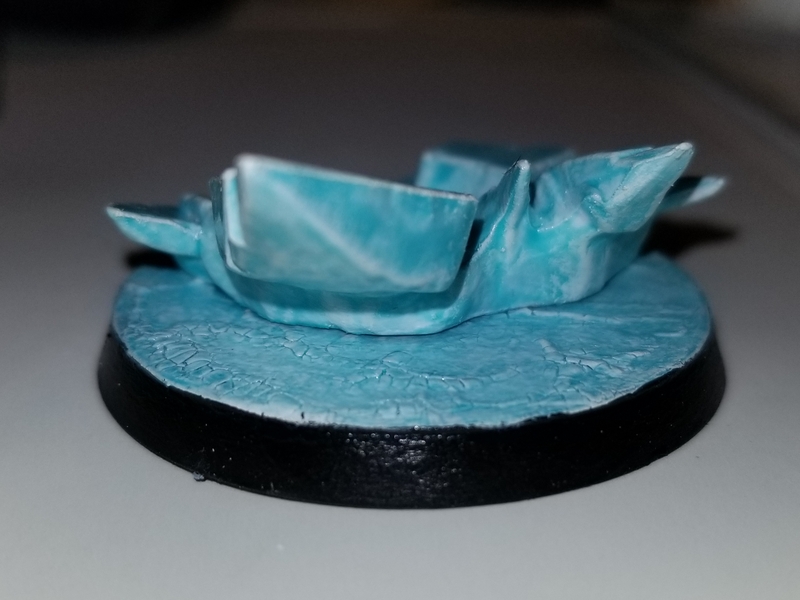 There is a Dreadnought specific Drop Pod (the Lucius Pattern Dreadnought Drop Pod) but it is a Forge World model that is no longer available (apparently someone dropped the mold and broke it). A while back they mentioned that they were working on a new mold for the model, so we'll see if that ever happens. The Lucius Pattern is a bit bigger than a normal drop pod, but if your opponent doesn't balk you could always just proxy it with a standard one. The rules for it are in the Imperial Armor: Forces of the Adeptus Astartes book sold by Forge World. The new Dreadnought Drop Pod was revealed and was for sale at the recent Forgeworld Weekender, so it did ever happen. It's just not up for sale on the website yet. Buyer pays for shipping. If you want nice models to survive shipping, you pay the price for stuff to be wrapped and padded. Hm, the 40k rulebook FAQ seems to be down. New FAQ incoming? They need to hurry the hell up and finish copy-pasting the vanguard marine rules from 40k to Kill Team so I can care about painting mine. I thought they were adding the vanguard marine rules to the new elite expansion for KT. I'm not even expecting most of these. I'm guessing the big highlights will be the beta bolter rule being made official, and maybe some kind of tweak to command points. In Chapter Tactics about two weeks ago Jeff Robinson said they were nerfing the Castellan but said he couldn't say how. He both does live streams for GW and is one of the major play testers. Ynnari are getting a brand new mini-dex in white dwarf. Everyone figures they are kaput. The other two well, not sure on either of those. I'm still not entirely convinced that the White Dwarf stuff isn't just going to be a reprint of their Index rules now that they're out of print. Sisters had similar but weaker "act twice" powers and they were nerfed hard in the CA beta codex, it'd definitely be a prime opportunity to do the same. The understanding is it will be more like Index Assassins/Index Crimson Fist that were published earlier this year. So a straight massive improvement. To be fair, the Ynnari need the buff. There are a couple of factions in the game that they actually lose to. So when is the White Dwarf out with their rules? I got a message saying my subscription was going to be 2-3 weeks late, and that GW was very sorry about that and promises it won't happen again. So did most of my club members. White Dwarf takes the slow boat via China to get to the States. 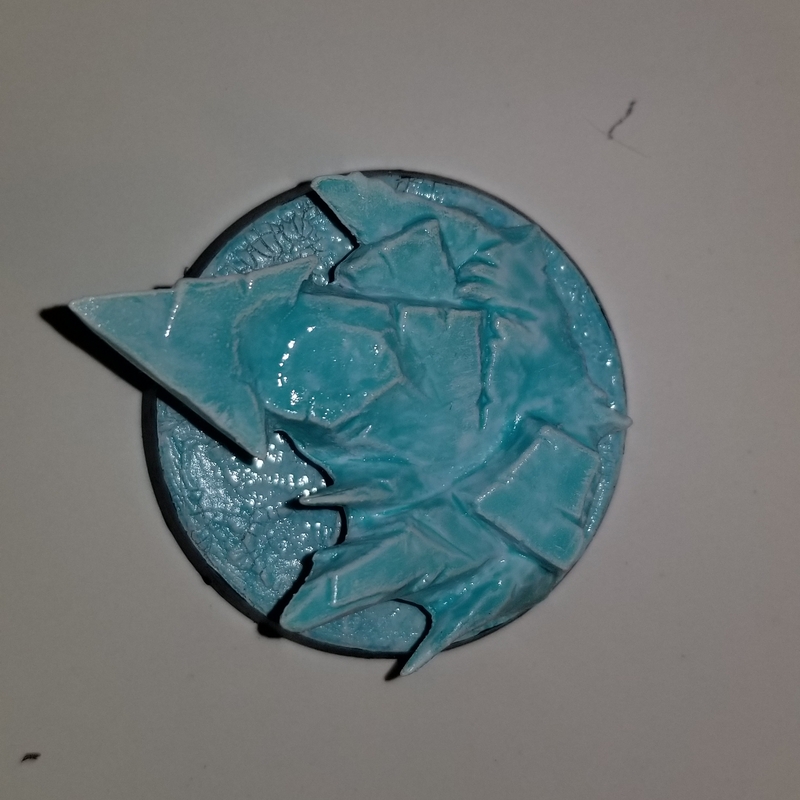 Working on an cracked ice base for my primaris Ragnar conversion I'm gonna be working on. The terrain on top still needs to be painted but the base itself is done. Do regular space marine torso parts fit to intercessors? I don't have any unbuilt intercessors so I can't test it. I dont think they would. The torso and legs of the Primaris marines basically fit together in one pose. The torso isn't cut in two at the waist like on the old marines. It basically means even the multi part kits are monopose. I want to use the cloak from Krom on this primaris Ragnar I'm working on since I'm already using bits. Feels like a waste to not use it. Edit: I'm suddenly losing a lot of steam on this project. I want to try and make green stuff bracers that match the ones the original Ragnar has and the diamond pattern with the wolf head on the left shoulder with green stuff. I tried using the wolf head half of a power axe from they grey hunters sprue but it's not big enough or at least doesn't feel big enough. Pretty sure the wolf side of a terminator thunder hammer will work but I only have 1 so I don't want to mess up. I'm also hoping the pose will look good. I'm trading one of my already built intercessors to a friend with unbuilt intercessors. I'm also trying to use as much of krom as I can because I dropped $30 on that HQ and now I'm using him for parts. Man. I'm still jiggling around a mono-codex, mono-detachment Harlequin list and all it's doing is reinforcing in my mind that most of the book is drastically overcosted. Like, there's no way that a Shadowseer should be more expensive than a Farseer, and Neuro Disruptors are hilariously weak considering that they cost 10 points each. You could cut the cost of everything except Skyweavers by 10-20% and they'd begin to look reasonable. When will it be out? I still would like the Crimson Fist one for various reasons so are they going to reprint that in a chapter approved? My understanding they will reprint these in Chapter Approved in December. Ynnari are this month or next month's White Dwarf. I can't remember which. How do the Space Wolves markings work on the right shoulder? For grey hunters the right shoulder is red with black markings but how do I determine what marking to put? I also see in the old codex that some of the grey hunter pack marks are red on blue. You don’t ‘determine’ it, you make up something that looks cool. The whole point is there is no set ‘codex’ pattern - the pack leader determines his own pack’s markings and can/will change them between campaigns or even battles to confuse the enemy (and coincidentally most allies) over who is where. That makes this a lot easier. I was kind of stressing over all the different options the old and new codex were presenting and trying to figure out if each one meant something or not. I'll just pick one I like and do each grouping of units with that pack marking. Looks like Sororitas are getting a complete line of new MK1 Deimos Rhino bas vehicles instead of using upgrade prues for the current MK2 plastic kit. I like they are going all out for Sisters. Army deserves it even if I have no interest in them. Now just do the Eldar range with similar upgrades. An Eldar update honestly can't be that far away, they're the very obvious next candidates after Sisters and Chaos. I'd guess we'll see stuff for them in either 2020 or 2021, maybe earlier depending on what happens with the Ynnari. Just... do something with Howling Banshees, for the love of God. They used to be one of the iconic Eldar units and I haven't seen them on the tabletop for years. Striking Scorpions still look like they are out of the Rogue Trader era.